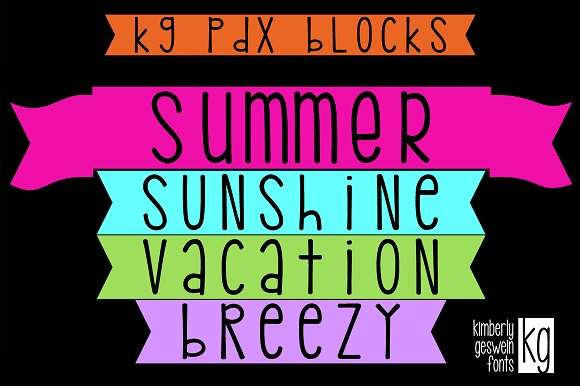 KG PDX Blocks is a display font designed by Kimberly Geswein and published on 2015-08-11. KG PDX Blocks Font is a super cute unicase, monospaced font that has a few tricks up the sleeve (for example use the bar keys ||||| to create solid spaces). An enclosed PDF will teach you how to get the special chars out of it. Enjoy another original font from KG! A font description published on Friday, July 7th, 2017 in Display, Fonts, Kimberly Geswein by Andrei that has 2,946 views.